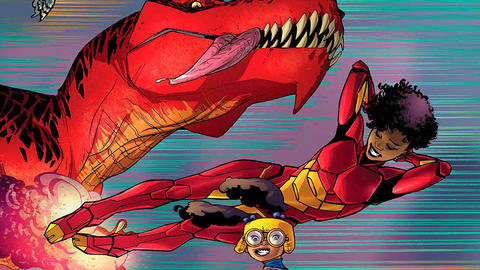 Brandon Montclare and Amy Reeder introduce RiRi Williams to Lunella Lafayette! When you get great minds together, great things inevitably happen. But factor in super powers, a jealous villain, and a large, red dinosaur and you have something really special going on! On January 25, the team behind MOON GIRL AND DEVIL DINOSAUR invite the latest and greatest mind of the Marvel Universe—RiRi Williams—to team up with the “Smartest There Is” in Lunella Lafayette, aka Moon Girl in issue #15 of the latter’s ongoing series! Before this story comes out, however, we wanted to talk with writers Brandon Montclare and Amy Reeder about why they think these two up-and-comers represent some of the most brilliant in the MU and how Ironheart’s arrival on the scene could be important for the precocious young Lunella. Marvel.com: Brandon and Amy, you just set loose the second part of “The Smartest There Is” story arc this past Wednesday, and next month, readers will see RiRi Williams, aka Ironheart, make her appearance in MOON GIRL AND DEVIL DINOSAUR. Why was RiRi someone you wanted to bring into Lunella’s world? Brandon Montclare: There’s a lot of wunderkinds—especially science brainiacs—among the younger, newer characters. Amadeus Cho was maybe the first, and he’s had a lot to do and say with Moon Girl. Now it’s RiRi Williams’ turn—and the fans have really been wanting to see this happen. That just shows you how popular Iron Heart is, even though she’s a very new character. There’s also Nadia Pym. And Lunella will be appearing in the early issues of UNSTOPPABLE WASP. You had Reed Richards, Tony Stark, Bruce Banner, and Hank Pym putting their heads together. It’s natural for this new generation to come together in the same ways. Amy Reeder: And even though I only got to draw her on the cover, she’s such a cool character with a great design. I’m excited for everyone to see [series artist] Natacha Bustos’ version of RiRi Williams. I was super excited when I saw it! Marvel.com: They do seem to have a lot in common. Would Lunella see RiRi as something of a role model or bigger sister? Amy Reeder: A big part of Lunella’s story is how difficult it is for her to connect with people. She thinks differently and doesn’t know how to let people in. With Hulk, he seemed paternalistic and maybe even condescending at first. But he had to have incredible patience with the precocious Lunella Lafayette. He’s bounced back into the story in issues #12-14, but Lunella still keeps him at arm’s length. I think the big sister stuff happened with Ms. Marvel in the second arc. Where the relationship lands between RiRi and Lunella is very, very important to #15, so readers will have to wait and see! But it’s safe to say that RiRi is one of the first people to “get” Lunella. Brandon Montclare: Yeah. I think the only one who really gets her—and who she lets in, even though she doesn’t really recognize it—is Devil Dinosaur. His unconditional support—again, never recognized—is probably the thing that’s allowing Lunella to grow. It’s not her smarts. Marvel.com: Like any siblings, however, rivalry usually factors into the equation at some point. Given that these two young women are known for their unparalleled intellect and ability, who do you think is the smartest? Amy Reeder: Ah! Again, we don’t want to spoil anything. But when the rivalry plays out in #15, I’ll say this: Expect the unexpected. Brandon Montclare: Lunella’s the Smartest There Is! I’m biased, of course, but it’s nonetheless true. It’s not just the Banner Box—by the end of the arc the world will start to clock that there’s a new top intellect in the Marvel Universe. And on that rivalry: Fighting over that kind of ranking maybe isn’t something that top minds do. Leave that to the second-raters like the apparently incongruous Doctor Doom that’s been stalking Moon Girl. Marvel.com: If you were limited to one reason as evidence for Moon Girl’s claim as the smartest genius in the Marvel Universe, what would it be? Brandon Montclare: If I had to pick one reason, it’s the Banner Box—the ostensibly “unsolvable” test that Bruce Banner left as his legacy. Reed Richards tried, but couldn’t crack it before [he] disappeared. More than just a puzzle to prove Lunella is the biggest genius in the Marvel Universe, it connects Lunella to past characters who are now gone. Marvel.com: On the other hand, what do you think makes RiRi competitive as one who could lay claim to that same title? Amy Reeder: Well, she built a suit of Iron Man armor out of spare parts, impressing the hard-to-impress Tony Stark. Not too shabby! But both these characters are new, and Marvel is going to be telling a lot of stories with these characters for years to come, which will back up their cred. Marvel.com: Any friendly competitions aside, what aspects of writing these characters’ interactions do you enjoy the most? Amy Reeder: All the interactions, honestly. It’s a great opportunity for character moments when these two meet. There’s plenty of action, and the background intrigue deepens a lot in this issue. But having these two talk is what’s most enjoyable, almost regardless of what’s happening around them. Brandon Montclare: I just like setting it all up for Natacha’s line art. As Amy mentioned, it’s full of character moments. That’s fun to write—but we write to showcase Natacha. There aren’t many people who can do it the way she does. And there’s no one who can do it as well with Moon Girl, that’s for sure. So we take advantage of that. We work hard to make every page visually interesting—or I should say, potentially visually interesting for Natacha to execute, with Tamara Bonvillain making her tremendous creative contributions with color. Natacha is an ace drawing expressions and emotional interactions, in general. And already having seen Natacha’s art on #15, I think these two specific characters playing off each other is something really special. Marvel.com: Last question! If we are looking at the two most intelligent minds in the Marvel Universe, what sort of villain would think to step up to the plate and confront them? Brandon Montclare: The one who popped up at the end of #14 isn’t going away anytime soon! Doctor Doom was always second-best to Mr. Fantastic. And it always bothered him. With Reed Richards gone, this should have been his big moment. But he’s trumped by the new kid on Yancy Street. Amy Reeder: Or is he? There’s some twists coming up that will definitely explain the inexplicable. 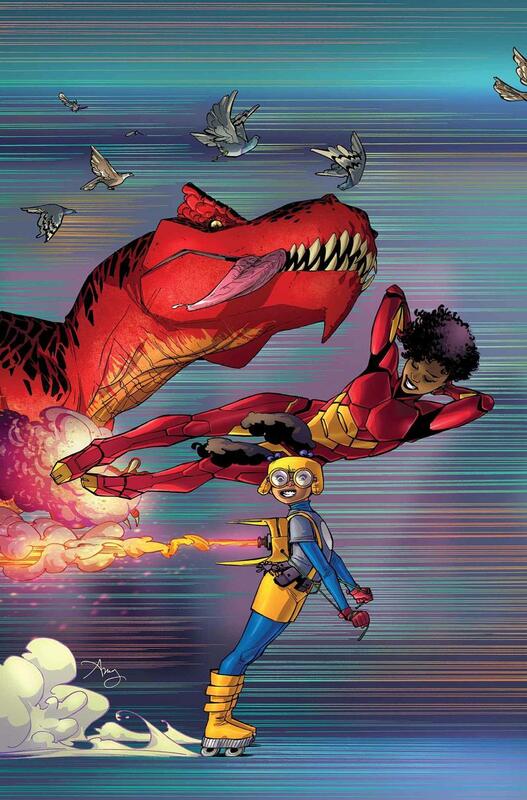 Step up for intellectual interactions aplenty in MOON GIRL AND DEVIL DINOSAUR #15, available January 25 thanks to Brandon Montclare, Amy Reeder, Natacha Bustos and company!